Like the long eye lashes of a pretty woman, the long stamens of two of my favorite flowers are catching the attention of visitors to the garden. 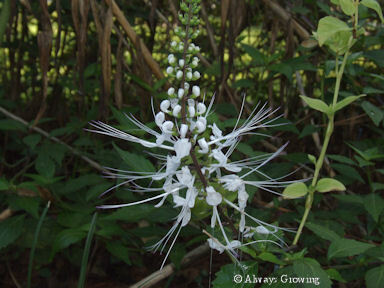 Cat’s Whiskers (Orthosiphon aristatus) starts blooming in the summer and one look at this flower’s extra long stamens explains its common name. Many people who have seen this flower are amazed by its unusual look and want to know what it is. More lycoris radiata or Hurricane lilies have popped up since my last post about these fall bloomers, and it seems that many people are not familiar with this plant. 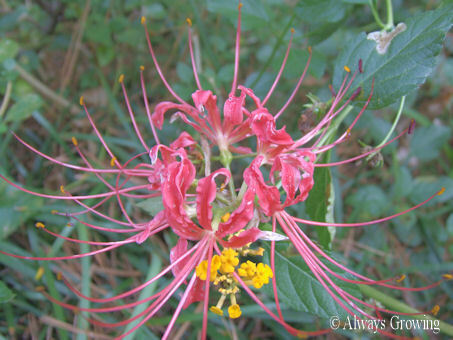 This is another long stamen flower, and those almost four inch spikes make for a striking flower especially when groups of them are in bloom. I have had more people stop and ask what these two blooming flowers are than ever before. Today was our first cool day since April, and it seems many walkers decided to take advantage of the low temperatures. Since more people were out and about, that accounts for the many questions about these flowers. They certainly gave me the opportunity to connect with many neighbors I hadn’t seen in a while. A few days ago, I was complaining about the hot dry weather we had been having for over three weeks. Well, that has changed, or at least the dry part has changed. The rains have arrived, and I can’t believe how fast the garden has perked up. I had been watering the garden, but there is nothing like rain to make plants stand up tall and grow. Of course, there was a big mistake made with watering just before the rains came. Wednesday, when I came home from work, I put out the sprinkler on the wilted hydrangeas. When I went upstairs around 8 that evening, dear hubby asked if I had the sprinkler on, and I was so thankful he said something about it because I had totally forgotten it was still running. Of course, he said he would go and turn it off. Unfortunately, he got sidetracked and forgot, and when I returned home from work on Thursday, the sprinkler was still running. (In the morning when I leave, it is still dark, so I didn’t see it was not turned off.) Needless to say, that area of the yard did not need the rain that came on Friday and today. You can bet we are not going to forget the sprinkler again. We’ve decided to put on a timer to remind us to turn the water off. 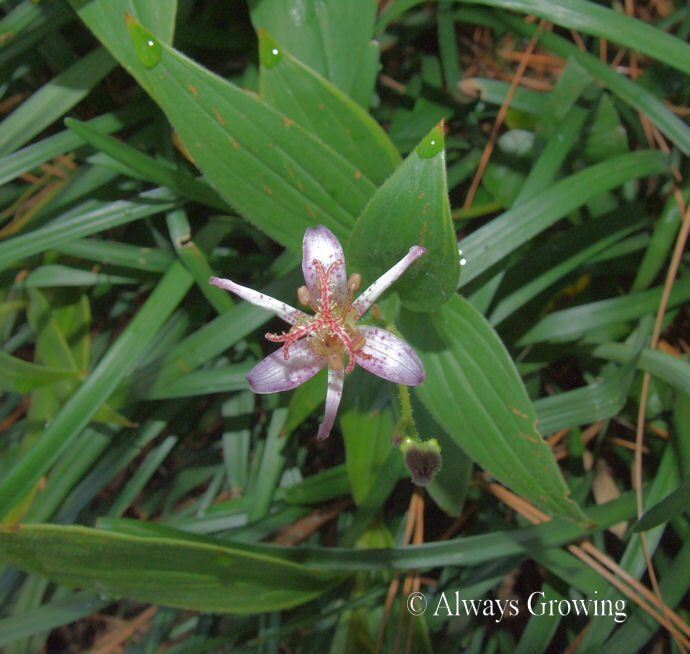 But the toad lilies are plants that are looking a lot better because of the rain. They are just starting to bloom and look like little jewels. Whenever we get a lot of rain, the frogs and toads can be heard in the evening singing. After a couple of days of rain, it is nice to see these “toads” in the daytime. Tomorrow will be our first full day autumn. While, here in the New Orleans areas we have had 17 straight days of 90+ temperatures which makes it feel like summer, I know it won’t be long before cooler weather is here. I can already tell by the angle of the sun that summer is over, even if the temperatures belie that fact. Autumn is my favorite season of the year. I love the colors, the cool temperatures after a hot summer, the fall holidays, harvest time, and the soft, golden color that the sun seems to bathe everything with. 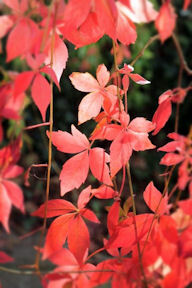 This is the busiest time of the year for me in the garden, and I am always happy when I am outside in my garden. For all of these reasons, I eagerly look forward to the autumnal equinox every year. The peak of hurricane season is around the 10th of September. This is also the time that the hurricane lilies start to bloom. 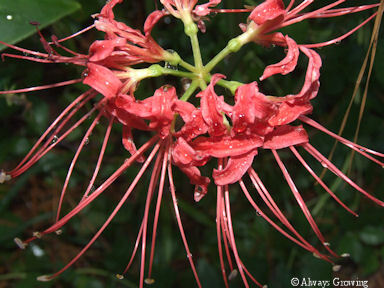 Hurricane lilies (lycoris radiata) or red spider lilies have started flowering. 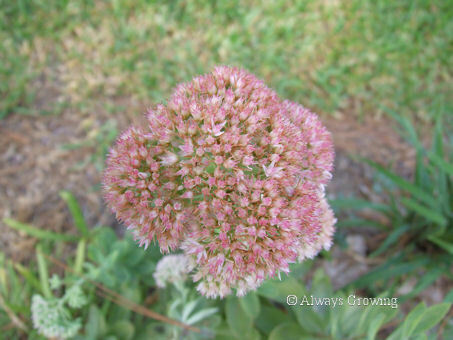 When my sister reported that hers were already blooming almost two weeks ago and mine were not, I was afraid that none of mine would bloom since these bulbs are notorious for being erratic bloomers. (Usually because they are overcrowded or the foliage is damaged by winter freezes) But, I shouldn’t have worried. Mine were just a little behind hers. These tall, leafless flower spikes just seem to pop up from nowhere. I have several areas throughout the garden with these bulbs, but, so far this year, only one area is showing any blooms. Maybe the other areas are just a little slower. I have been thinking that maybe I should dig up all my spider lily bulbs and plant them in one area. That way when they start flowering, it will make a better show. A large area of these red flowers with the long stamens would look better than just having them scattered about the garden. If I decide to do this, I will have to wait until spring when the foliage starts dying back. Gives me some time to prepare a bed for them. I’d rather have hurricane lilies than hurricanes, and so far this year, it looks like we will only have the flowers. This has been a very good year for coleus here. In fact, it has been so good that I have been able to make several cuttings that are now good sized plants that are residing in containers and in different areas around the garden. About two weeks ago, I started new cuttings for fall planting. Since our first freeze date is not until November 15th, and often it is not until late December until we have a freeze, these new cuttings will be a nice addition to the late year garden. I used mostly autumnal colored coleus since those colors will be the most appropriate for the season. These new plants will have to make up for the lack of fall leaf color around here. They all have a good root system, so it looks like this weekend will find me potting up my little babies. I love getting plants for free. No matter how many years you may have been gardening, there is always something new to learn or try. For me, this spring brought something new to try. Many plants that can be grown in other areas just will not survive our hot summer days and nights. It is not unusual for temperatures to not dip below 85 for days or nights. In fact, it is not uncommon for some nights that it will be almost midnight before we are out of the 90’s, so many plants that will survive in areas with at least cooler nights will not make it through the summer here. 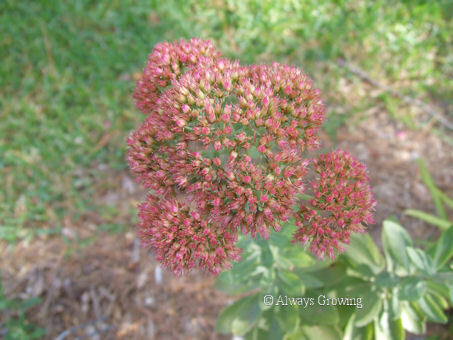 I have always thought that Sedum Autumn Joy was such a lovely plant when it bloomed in the fall. I would see photos in magazines that just made me want to grow this for early autumn color when most of the garden was looking pretty shabby, but you just did not see it available around here. A few years back when Autumn Joy started showing up for sale, I was hesitant to purchase it because I was not sure if it would do well here. After all, I have seen so many plants for sale around here in early spring that will just die when the first big heat wave comes through (I am referring to peonies, lily of the valley, lilacs, etc all which I have seen for sale). 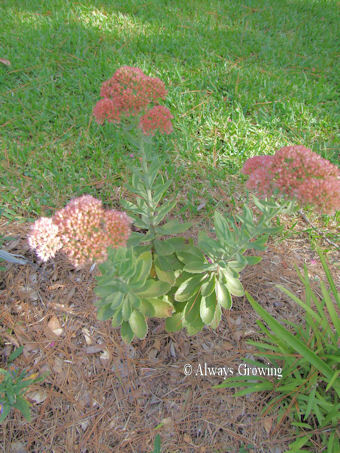 Any way, since this sedum has been for sale for a few years around here, and even though I have never seen it grown in any garden around here, I decided to give it a try. My three small plants have done fairly well and have rewarded my faith with their wonderful autumnal-colored flowers. When I saw that the flowers were turning pink, I was very excited. I know many of you will not think that growing Autumn Joy is a big deal, but it is a first time for me, and I am thrilled they survived, grew, and bloomed in the Deep South. I don’t know what is happening lately, but I just am so busy that I can’t blog as much as I want to. I use this blog as a way of keeping a record of what is happening in my garden, so I really do want to post more regularly. I used to be able to write a post everyday, but now, life is getting very complicated. So, let me catch up a little with what has been going on around here. This morning, after my coffee, I went upstairs to get dressed and what was on my bedroom curtains – a large lizard. Now, I do like to see lizards around the garden but definitely not in the bedroom. As I went to find dear hubby so he could remove said lizard, I passed by my little button fern and immediately noticed something strange. On closer inspection, I realized it was a snake skin. 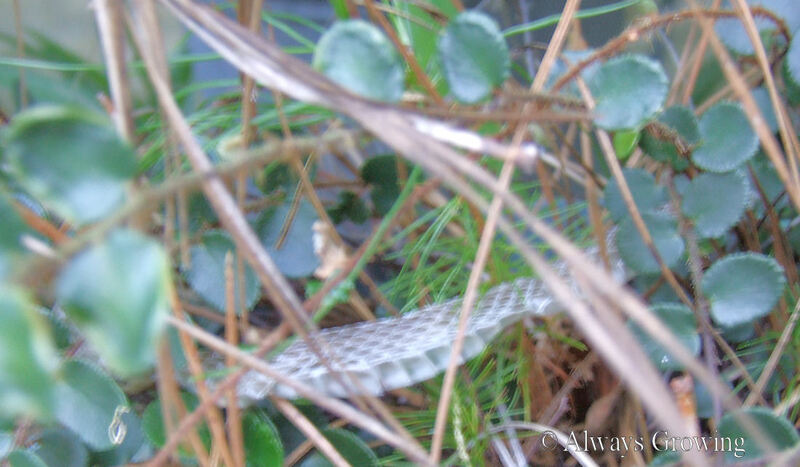 This is the first time we have ever seen a snake skin around, and I am not too thrilled it was so close to the house. It must be from this little fellow we saw earlier in the summer. Snakes are very beneficial to the garden. They eat insects and rodents. I have read that they can really do a number on grasshoppers. I wonder if that is why I am not seeing as many lubbers as I used to. The snakes do this work without damaging the garden. Garter snakes are supposed to eat slugs, and anything that eats slugs can’t be all bad. In general, you have nothing to fear from snakes. This is especially true if you live in the United States. Only four species of snakes are dangerous in The United States. They are the copperhead, the rattlesnake (several species) the cottonmouth, and the coral snake. Now these are the ones you need to avoid and not invite into your garden. 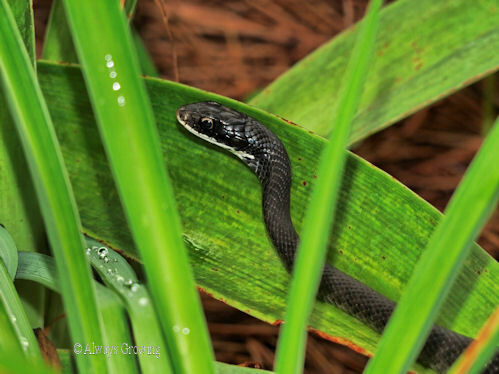 If you see a snake in your garden, remember they are keeping the grasshopper, cricket, mice, moles and other critter populations down, making for a nicer garden. They want nothing to do with you. Try to overcome your fears and enjoy the benefits the snakes are providing. Now, as for me I don’t mind an occasional snake in my garden as long as I don’t see it. I finally am able to welcome an old favorite plant back into my garden. 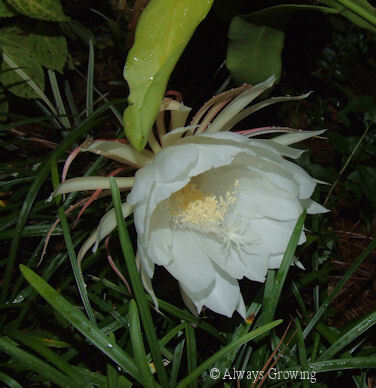 Years ago, my mother gave me a cutting from her night blooming cereus (Epiphyllum oxypetalum), and we enjoyed waiting and watching the gorgeous white blooming flowers for many years. Unfortunately, a few years ago, I lost my plant during a winter freeze. 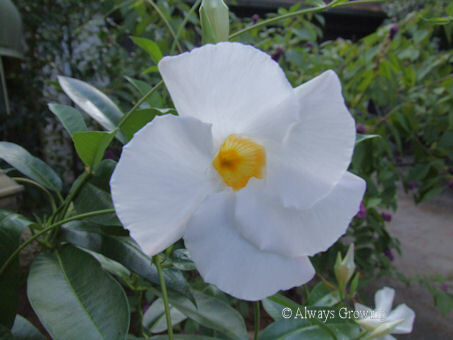 I was disappointed not only because I would no longer see these pretty, white flowers, but also because I had lost a plant that had been in my mother’s garden for so long, and there were so many good memories associated with the flower. The family staying up late to see the flowers, trying to freeze one of the flowers to preserve it (doesn’t work), kids excited to see such a strange flower, all these memories were conjured up every time I would look at the flowers. 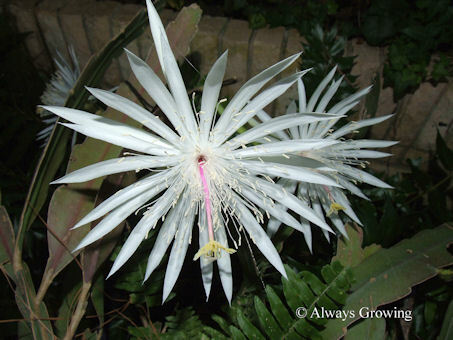 Two years ago, I happened to mention to my sister that I had lost mom’s cereus in a freeze. She promptly spoke up and said she had mom’s plant and would give me a cutting. That cutting finally bloomed. Part of the excitement over this flower is the anticipation. It seems as if the bud should open, and then, nothing. You keep checking night after night knowing if you miss the opening one night, the flower will be totally wilted by dawn. Here is the prehistoric looking bud. The gorgeous white flower shows up very quickly. It is so good to have this plant back in my garden and blooming. One other night bloomer in my garden was given to me by a very generous neighbor. 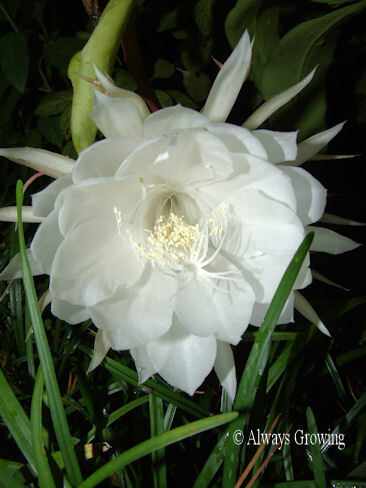 It is Epiphyllum hookeri. 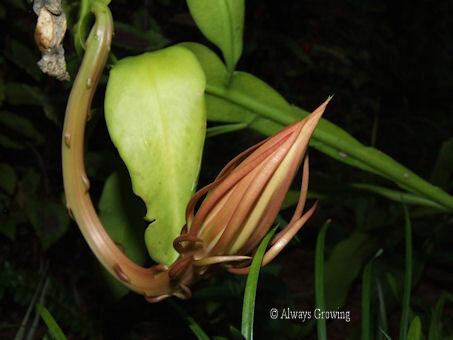 This flower, too, opens at night but will last until morning if protected from the sun. While my neighbor gave me a plant, I have made numerous cuttings and have several plants around the garden. 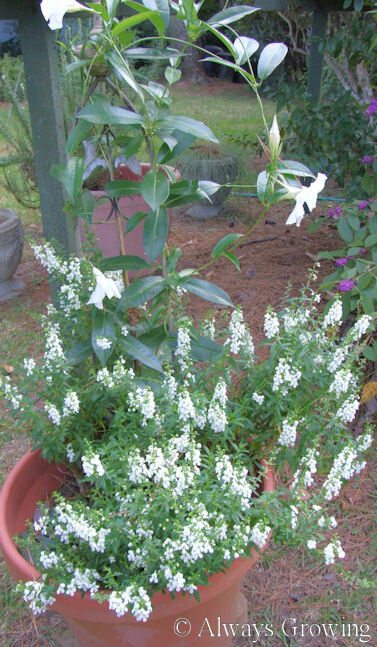 Both of these plants are very easy to propagate – just stick a leaf in soil and soon you have a plant. These must be protected in winter as they are tropicals, but these flowers are certainly worth that effort.